Gucci wants the kids, and the grownups, to know it’s hip. For its latest campaign, the luxury fashion house has commissioned a number of memes for Instagram around the theme “#TFW Gucci” or “That Feeling When Gucci”—playing on the popular internet art form to promote a new line of wristwatches. “When you got that new watch and you have to show it off,” reads one caption on a photo featuring a man’s arm, with a hole torn in the wrist of his suit and dress shirt to show the timepiece underneath. “When he buys you flowers instead of a Gucci watch,” reads a second, featuring a deadpan 16th century portrait of the Spanish noblewoman Eleanora di Toledo. “Watchdog,” reads a third, featuring a dog’s leg, wearing, naturally, a watch. #TFWGucci Documentary photographer @littlebrownmushroom (Alec Soth) is known for his melancholic images that capture small-town landscapes and people. With a sly wit, his bare-bones memes have the same creative focus that makes him an art-world social media favorite. His Instagram account is a playful mix of his latest photos, funny screencaps, and cryptic text message exchanges, and his sharp take on the Gucci #LeMarchédesMerveilles watch for the #TFWGucci project — conceived of and photographed solely by Soth himself — would fit right in on both Reddit and the runway. - Text by @tatianaberg. Read more through link in bio. Those pieces, created by photography team @meatwreck (née Mitra Saboury and Derek Paul Boyle), designer @williamcult (William Ndatila) and documentarian @littlebrownmushroom (Alec Soth), are just a handful of many from a variety of internet artists, housed on a website for the Gucci campaign. The landing page of the #TFWGucci microsite also offers a brief history of memes, for those too old or oblivious to understand them intuitively (generally speaking, they are striking images or animations paired with clever or revealing text, shared online, where others can riff on them, as a form of common expression—a sort of digital high five or fist bump proliferated through visually driven social media sites like Tumblr, Facebook and Instagram). As other observers have pointed out, the brand’s explainer is both amusing and necessary. Given the high cost of Gucci’s products—one of the Le Marché des Merveilles watches costs about $790—it’s unlikely many but the most well-to-do youngsters are likely to spring for its products, while more aged and wealthy consumers might find themselves scratching their heads at ads that range from goofy and irreverent to garish. The net result is a curated collection of pieces that feel like an online gallery show, complete with blurbs for each work. While that might seem like a stuffy attempt to bridge two worlds, the truth is, it makes for pretty entertaining browsing—thanks largely to the different perspectives of the talents on display. Even though they’re shamelessly hawking an entirely unnecessary expense, they’re also self-deprecating, timely (groan), and most important, human—i.e., delightfully and honestly absurd. #TFWGucci @flamigram cycles through several different media, including water-color painting and sculpture, and her #TFWGucci collaboration is similarly hands-on. 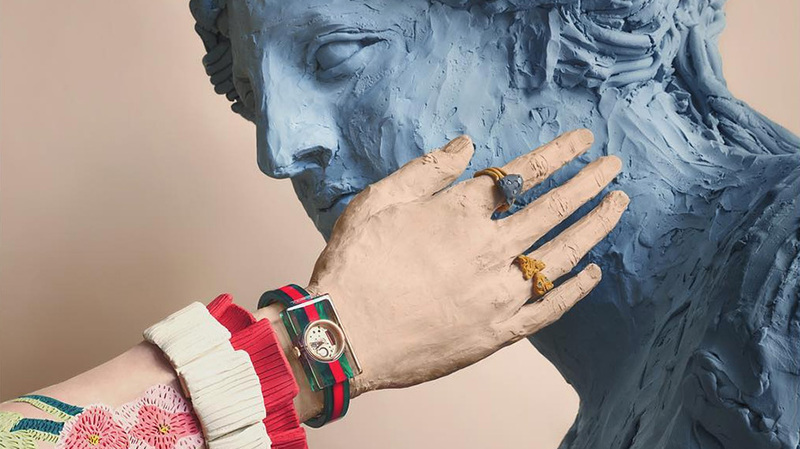 Rather than pasting pictures in a digital landscape, she preferred to sculpt clay figures in this artwork: an outstretched hand, clad with rings and a #Gucci #LeMarchédesMerveilles watch, reaches out to touch a statue’s lovely face. Recreated from a #Gucci campaign shoot, the result is sweet, sad, and not a little lonely, like a Giorgio de Chirico painting. Meme by the Internet culture-savvy @cabbagecatmemes. - Text by @helenh0lmes. Read more through link in bio.